This is a site dedicated to my Porsche 944 projects. This journey began after watching an episode of "Wheeler Dealers" where these two English guys purchased a Porsche 924 for 900 pounds. First this reminded me of my love for the Porsche 944 back in the late 80's, secondly i could not believe how inexpensive this car was to buy. I started looking at 944's and after looking at many abused cars, I found a 1987 944, one owner, 120K miles, garage kept, complete paperwork, for a great price! This "great deal" and a few more 944 great deals have been draining all my spare cash now for quite some time and led to what my wife calls "a mid life crisis". 10/23/16 - Great 944 Meet and Greet and Mountain Run. Check out the video from the event (see here). 10/1/16 - Completed build of 16V 3L turbo motor for my friend Jon Gearhart. 8/18/15 - Installed Koni Sports. Weltmiester Springs, and 28 mm torsion bars on the NA. Dan took 1st in class at AutoX with the updated suspension. 3/26/15 - Installed new high flow head and cam and made a trip to the dyno, Car put down 535 wrhp (about 600bph). 4/17/14 - 951 put down 508 rwhp, thats about 570 bhp! See results here. 11/9/13 - Took the 951 to the drag strip. Car did great, driver needs some work. 10/2613 - DE Track Weekend at Road Atlanta. 10/1/13 - Attended PCA Concours at Piedmont Park. The 951 took 2nd place in class. 8/10/13 - Attended a great gathering of 944's in Atlanta with over 30 944's in attendance. 7/1/13 - Modified the stock intercooler and fabricated new intercooler pipes. 6/20/13 - Dyno trip for the 951. Car put down 473 rwhp/574 ft-lbs with some tuning issues. Stay tuned. 5/18/13 - My son Dan purchased a 1987 944 NA. The car has 68K original miles and is extremely clean. 4/13/13 - Took the 951 to Orlando for a 944 Rally. Great time and saw a lot of nice cars. Some pics from the trip here. 4/7/13 - Completed 3.12L Hybrid Ultra Stroker Build. See build details here. 9/28/12 - Trip to the dyno. 2.85L exceeded all goals. See results here. 9/12/12 - Completed Hybrid Stoker Motor. 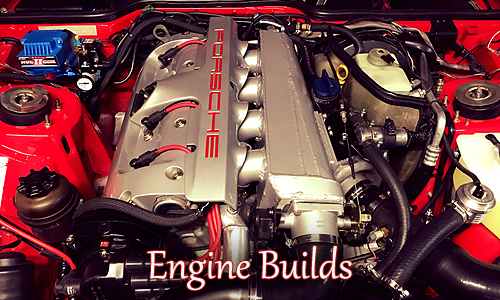 Motor is a 2.85L with Eagle Mitsubishi Rods and JE Small Block Chevy Pistons. See here for build details. 7/12/12 - Completed High Flow Head. Details coming soon. 5/5/12 - Preparing 951 for June 24th PCA Concours. See detailing progress and improvements here. 4/15/12 - Entered the 86 944 NA in the Peachstate PCA Concour and she took 1st Place in class (Full Concour). See Here. 4/1/12 - Replaced the clutch, pressure plate, and release bearing on the 944 NA, The original clutch had the rubber center that failed. See Here. 2/3/12 - Purchased a 1986 944 NA with 58K original miles. I am the third owner. This is the cleanest 944 I personally have ever seen! See Here. 11/7/11 - Purchase a set of Recaro Evo 8 seats that I found on Craigslist for $400!. The seats were like new. Installed them along with 4 point harnesses shown here. 10/20/11 - Designed a gauge panel using software from frontpanelexpress.com. See how it turned out and download the design file here. 10/7/11 - Replaced Oil Filter Housing seals on the 951. Also had the Oil Cooler lines rebuilt by a local hydraulics shop. 9/30/11 - Installed M030 front sway bar along with KLA Industries added sway supports. 9/26/11 - 951 started using coolant and exhaust smelled of coolant. Head gasket was leaking into #4 cylinder. Had to replace the head gasket (used the stock gasket). Had the head cleaned, checked, and new valve seals installed. Also installed Saturn Exhaust Studs and removed the belt covers. This took about 20 hrs. 9/14/11 - Trip to the dyno after the install of new turbo and the M Tune. 951 exceeded my expectations by producing 337 rwhp/347 ft-lbs torque. Results can be seen here. 9/13/11 - Installed new turbo along with the Rogue Tuning M Tune (see here). Installing the TO4E turbo was no simple matter. The install requires modifications to the several brackets, the alternator shroud, and the TB spring. See photos here. 8/20/11 - Purchased a DBB TO4E .50 trim garrett turbo with a replica KKK#8 turbine housing. Looking to make a major power increase in the 951. 7/30/11 - Converted the 944S AC from R12 to R134a. Replaced the heater clip on both the 951 and the 944S. My wife got on me a bit for not working on the 944S (her car). AC blows nice and cold for her now. Back to the turbo. 7/12/11 - Purchased S2 LSD (AOT) Transmission with about 95K miles. This unit has 3.875 ring and pinion instead of the 3.375 in the turbos. The AOT transmissions also have the stronger differentials and a taller 5th gear set. It makes the car so much quicker around town and helps acceleration and overall drivability. 6/20/11 - Installed Stainless Steel Aeroquip fuel lines on the 951, replaced the original rubber lines that were 25 years old. 6/16/11 - Trip to the Dyno. 951 performed well putting out 246 rwhp and 323 ft-lbs of torque. See the chart here. I think this is about the most I will get from the K26/6 turbo. In the fall I will install a Garrett T3/T4R dual ball bearing unit with T04E housing, 50 trim, and #8 KKK replica housing. I also plan to install the Rogue Tuning M-Tune MAF at the same time. 6/6/11 - Installed Tial 38 mm Wastegate with stainless steel adapter plates from Pauer Tuning. Also installed 80 lb high impedance fuel injectors and modified Rogue A-Tune chip. Will be running E85 in the 951. 6/4/11 - Track day at Road Atlanta. 4/21/11 - Trip to the Dyno. 951 performed well putting out 238 rwhp and 282 ft-lbs of torque. See the chart here. Boost pressure bled off to just over 9psi at the end of the run. The next mod will be a Tial 38mm wastegate. 4/19/11 - Installed the Rogue Tuning A-Tune (see here). The A-Tune requires modifying the DME (converting to 28 pin and cutting a resistor lead) and the addition of a MAP sensor. Rouge Tuning's A-Tune makes the DME boost aware and greatly expands the fuel and timing tables in the DME. The 951 is transformed! 4/18/11 - Installed LR Billet BOV. Super easy install and replaced the OEM BOV that is prone to fail. Also installed 3 Bar FPR required for A-Tune. 4/14/11 - Removed the LR MAF and installed stock air box along with AFM. Purchased stock air box, AFM, and J-Boot on Ebay for $200 shipped. Had to do a lot of cleanup but underneath all the grim they where in good shape. 3/31/11 - Purchased Ostrich from Moates and preparing to use Rouge Tuning's DIY tuning solution (see here). Been reading everything I can about DME, MAF, AFM, ect. I will eventually go a different route (true MAF or standalone) but I think this will help me get a great handle on the electronics. 3/24/11 - Completed initial tune and went to the dyno to get a baseline. Local shop has $50 Thursday night dyno special (www.dynolab.net). Learned all about over-boost protection as I had set boost to 15 psi with MBC not realizing the DME would shut the car down at around 12 psi with stock chips! 3/18/11 - Replaced the DME as I was experiencing strange AFR drops and my original DME was 1st generation with the chip soldered in. Purchased a used later model 24 pin DME that I will be converting to 28 pin (see here). 3/14/11 - Waxed the 951 for the first time since the re-spray. Used a lot of great info from Wayne Graham's (OZ951) site (see here). 3/5/11 - Install a new Bursch 2.5" Test Pipe I purchased from Pelican Parts. I am amazed how light it is compared to the stock pipe with the cat. 3/3/11 - Installed control arms on the 951 I bought off the forum. Solid ball joint and like new bushings. 3/2/11 - Completed install of Zietronix Zt-2 Data logger to be used for tuning. Used instructions by Tom M’Guinness found here. 2/28/11 - Completed rebuild of the front struts for the 951. Not to bad, used Paragon's Tech Session instructions found here. 2/20/11 - Found why the 951 had high speed wobble. Ball joint on the passenger side was totally shot. This was a very dangerous situation. This is why the suspension must be one of the first things addressed! 2/16/11 - Ordered Koni's (from Paragon) all the way around for the 951. 2/15/11 - Found a broken wire when replacing the O2 sensor on the 944S that prevented it from going closed loop. It finally passed emissions! 2/1/11 - The dark days of winter have almost passed! Lots to be done this spring! 10/21/10 - Replaced all the vacuum lines on the 944S. Also, had the valve cover and the intake manifold powder coated. 10/7/10 - Purchased and installed a Redline Rollbar in the 951. Rollbar bolts into the rear seat belt mounting points. 9/21/10 - 951 Engine back together and running great. 9/7/10 - 951 Engine work begins, replace vacuum lines, replaced TPS, replaced throttle body o-ring, installed manual boost controller, sent intake manifold out for powder coating. 9/4/10 - 951 post-paint assembly complete. I think I will think long and hard before I decide to paint another 944. It was a huge time commitment but the results are awesome! 8/4/10 - 951 returns home from the paint shop. The work of putting it all back together begins. 7/10/10 - 951 goes to paint. Begin cleaning all the removed parts getting ready for the return. 5/10/10 - 951 tear down for re-spray. This was a huge task. Removed front bumper, rear bumper, skirts, tail lights, marker lights, hatch, windows, mirrors, door trim, door handles. Prepped car for paint. 5/7/10 - 951 gets new sway bar bushings as leaking power steering fluid had destroyed old ones. 951 is declared leak free (for now). 5/1/10 - 951 power steering pump and rack are rebuilt. All power steering hoses replaced. I think every component is the power steering system leaked! 4/10/10 - 951 gets new belts, rollers, seals, and water pump. Also replaced the cam housing gasket as it was leaking. 2/3/10 - Purchased a 1986 944 Turbo for $3300. I still think this car was a great find but it had many problems lurking.